This review first appeared in the November/December 1991 issue of Living Blues magazine. Quite a surprise, this rich, rewarding album that keeps finding its way back into the CD player. 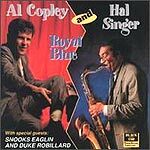 Ranging from swing to R&B to boogie to jazz and back again, Al Copley and Hal Singer's joint venture rarely lets down for so much as a measure. The choice of material is excellent, the playing joyful. So, why a surprise? Because of the very flatness of Copley's 1989 Black Top release, "Automatic Overdrive." Not only does the style of music range broadly on "Royal Blue," but so does the style of Copley's piano playing. For instance, on a cover of Art Tatum's "Elegie," Copley's work has a classical sound, much like Tatum's own approach. Not to be ignored, either, is the gumption needed to approach a song by as talented a virtuoso as Tatum. Copley's version of this richly textured piece is near-flawless, and may be the musical hallmark of this album if just for the sheer technical skill required. Singer steps forth on a Copley original, "That's Hal," a straight-ahead jazz piece apparently inspired by the Lester Young-penned Basie band standard "Lester Leaps In." Both songs feature the piano and tenor sax trading leads, with Copley capturing Basie's Kansas City sound. The above two cuts are all the more impressive when one considers that Copley didn't need to take the chance. He could have stuck to the shaking boogie pieces his reputation was built on with Roomful of Blues. If there is a weak link in all of this, it is Copley's singing. Still, his voice is passable, the delivery impassioned, and the enthusiasm contagious. Only a real curmudgeon would complain about an album this good.